This page contains stories of Aphrodite and the loves of gods and men including the birth of Eros (Love), the many loves of Zeus, Haides' abduction of Persephone, the romance of Jason and Medea, and the goddess in the fables of Aesop. Eros was usually called the son of Aphrodite. Some say that the goddess was born pregnant with the godling, others that Ares was his father. "Apollonius makes Eros child of Aphrodite . . . Simonides child of Aphrodite and Ares, Ibycus [the same]." "Apollonius makes Eros child of Aphrodite . . Simonides makes him child of Aphrodite and Ares." "Sokrates: Well, and is not Eros (Love) the son of Aphrodite, a god?" "Aphrodite of many counsels, queen of Paphos, bare thee [Eros] a winged god on soaring pinions." 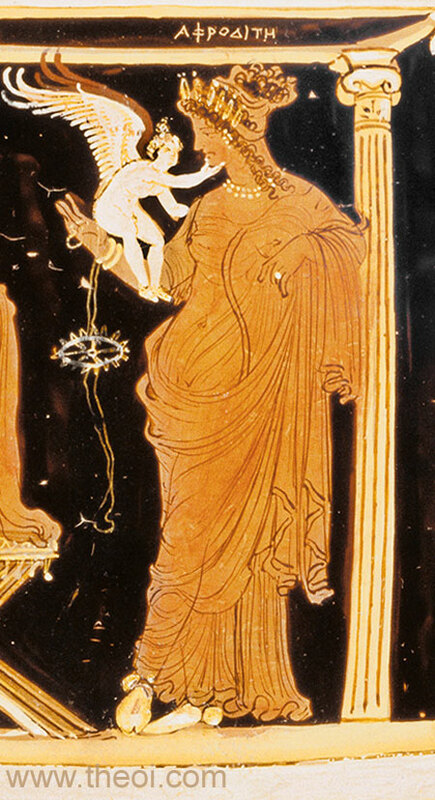 "[Venus or Aphrodite] the mother of the Amores [Erotes, loves]." "Thou goddess [Aphrodite], born of the cruel sea, who art called mother of both Cupides [Loves, i.e. Eros and Anteros], that wanton, smiling boy of thine." "Heavenly Venus [Aphrodite]; gave birth to Amor [Eros, love] when the world was first begun." "There, as soon as she [Aphrodite newly born] was seen on the neighbouring harbourage [of the city of Beroe in Lebanon], she brought forth wild Eros (Love), first seed and beginning of generation, quickening guide of the system of the universe; and the quickleg boy, kicking manfully with his lively legs, hastened the hard labour of that body without a nurse, and beat on the closed womb of his unwedded mother; then a hot one even before birth, he shook his light wings and with a tumbling push opened the gates of birth. Thus quickly Eros leapt into his mother's gleaming arms, and pounced at once upon her firm breasts spreading himself over that nursing bosom. Untaught he yearned for his food; he bit with his gums the end of the teat never milked before, and greedily drank all the milk of those breasts swollen with the pressure of life-giving drops." "On the birthday of Aphrodite there was a feast of the gods . 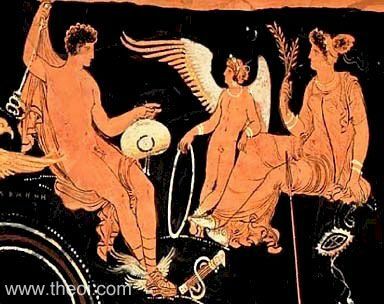 . . [after which Penia seduced the god Poros] she lay down at his side and conceived Eros (Love), who partly because he is naturally a lover of the beautiful, and because Aphrodite is herself beautiful, and also because he was born on her birthday, is her follower and attendant." "[The sea-god Nerites loved by Aphrodite] was permitted to grow wings : this, I imagine, was a gift from Aphrodite. But even this favour he counted as nothing [he refused to follow her to Olympos]. And so the daughter of Zeus was moved to anger and transformed his shape into a shell, and of her own accord chose in his place for her attendant and servant Eros, who also was young and beautiful, and to him she gave the wings of Nerites." "The Mousai tied Eros with garlands and handed him over to Kallei (Beauty). And now Kythereia [Aphrodite] brings a ransom and seeks to have him released. But if he is released, he will not leave but will stay: he has learned to be her slave." "Eros once failed to notice a bee that was sleeping among the roses, and he was wounded: he was struck in the finger, and he howled. He ran and flew to beautiful Kythere [Aphrodite] and said, ‘I have been killed, mother, killed. I am dying. I was struck by the small winged snake that farmers call "the bee".’ She replied, ‘If the bee-sting is painful, what pain, Eros, do you suppose all your victims suffer.’"
"About the posts and pillows of her [Aphrodite's] couch swarm a troop of tender Amores [Erotes the Loves], begging her make sign where she bids them bear her torches, what hearts they shall transfix; whether to wreak their cruelty on land or sea, to set gods at variance or yet once more to vex the Thunderer [Zeus]." The age of heroes ended with Zeus deciding to put an end to Aphrodite's practise of mating gods with men. To this effect he caused her to fall in love with a mortal man, and suffer the strife of bearing a mortal son. "Upon Aphrodite herself Zeus cast sweet desire to be joined in love with a mortal man . . . lest laughter-loving Aphrodite should one day softly smile and say mockingly among all the gods that she had joined the gods in love with mortal women who bare sons of death to the deathless gods, and had mated the goddesses with mortal men." "[Aphrodite addresses her mortal lover Ankhises :] ‘Now because of you I shall have great shame among the deathless gods henceforth, continually. For until now they feared my jibes and the wiles by which, or soon or late, I mated all the immortals with mortal women, making them all subject to my will. But now my mouth shall no more have this power among the gods; for very great has been my madness, my miserable and dreadful madness, and I went astray out of my mind who have gotten a child beneath my girdle, mating with a mortal man.’"
Aphrodite bore Ankhises a son, the hero Aeneas, who was by tradition the last mortal child born to be born of a divine parent. After her experience with Ankhises, Aphrodite then ceased her practise of mating gods with mortal women and men. So, by the will of Zeus, the Age of half-divine Heroes came to an end and the [current, historical] Age of Iron began. "Golden Aphrodite Kypria, who stirs up sweet passion in the gods . . . Even the heart of Zeus, who delights in thunder, is led astray by her; though he is greatest of all and has the lot of highest majesty, she beguiles even his wise heart whensoever she pleases, and mates him with mortal women, unknown to Hera." "[Aphrodite] joined Zeus in wedlock with Hera his sister, after he had felt the pangs of longlasting desire and desired her for three hundred years: in gratitude he bowed his wise head, and promised a worthy reward [to Aphrodite] for the marriage." "The sign the Greeks call the Swan, but others, out of ignorance of the story, have called it ornis, the general term for bird. This reason for the name has been handed down: When Jupiter [Zeus], moved by desire, had begun to love Nemesis, and couldn't persuade her to lie with him, he relieved his passion by the following plan. He bade Venus [Aphrodite], in the form of an eagle, pursue him; he, changed to a swan, as if in flight from the eagle, took refuge with Nemesis and lighted in her lap. Nemesis did not thrust him away, but holding him in her arms, fell into a deep sleep. While she slept, Jupiter [Zeus] embraced her, and then flew away. Because he was seen by men flying high in the sky, they said he was put in the stars. To make this really true, Jupiter put the swan flying and the eagle pursuing in the sky." "Tyrannus [Haides] had left his dark domains to and fro, drawn in his chariot and sable steeds, inspected the foundations of the isle [of Sicily]. His survey done, and no point found to fail, he put his fears aside; when, as he roamed, Erycina [Aphrodite], from her mountain throne, saw him and clasped her swift-winged son, and said : ‘Cupido [Eros], my child, my warrior, my power, take those sure shafts with which you conquer all, and shoot your speedy arrows to the heart of the great god to whom the last lot fell when the three realms were draw. Your majesty subdues the gods of heaven and even Jove [Zeus], subdues the Gods of the Sea (Numina Ponti) and him, even him, [Poseidon] who rules the Gods of the Sea (Numina Ponti). Why should Tartara (Hell) lag behind? Why not there too extend your mother's empire and your own? The third part of the world's at stake, while we in heaven (so long-suffering!) are despised--my power grows less, and less the power of Amor [Eros]. Do you not see how Pallas [Athene] and Diana [Artemis], queen of the chase, have both deserted me? And Ceres' [Demeter's] daughter [Persephone], if we suffer it, will stay a virgin too--her hope's the same. So for the sake of our joint sovereignty, if that can touch your pride, unite in love that goddess and her uncle [Haides].’ So she spoke. Then Cupido, guided by his mother, opened his quiver and of all his thousand arrows selected one, the sharpest and the surest, the arrow most obedient to the bow, and bent the pliant horn against his knee and shot the barbed shaft deep in Dis' [Haides'] heart." The three virgin goddesses were immune to the power of Aphrodite. "Golden Aphrodite Kypria, who stirs up sweet passion in the gods . . . Yet there are three hearts that she cannot bend nor yet ensnare [those of Athena, Artemis and Hestia] . . . Of these three Aphrodite cannot bend or ensnare the hearts." "[Venus-Aphrodite addresses Cupid-Eros :] ‘Do you not see how Pallas [Athene] and Diana [Artemis], queen of the chase, have both deserted me?’"
He obeyed her request; treading on Time's heels hot Eros (Love) swiftly sped . . . [and] near the Assyrian rock he united from fiery arrows on one string, to bring two wooers into like desire for the love of a maid [Beroe], rivals for one bride, the vinegod [Dionysos] and the ruler of the sea [Poseidon]." "And of your [Asopos'] daughters [Zeus has three; and Poseidon, married three; and Phoibos two, and Hermes one. For so did the pair Eros and Kypris [Aphrodite] persuade them, that they should go in secret to your house and take your nine daughters." "[Depicted in a painting of Erotes in an apple orchard :] Nymphai (Nymphs) have established a shrine to her [Aphrodite], because she has made them mothers of Erotes and therefore blest in their children." "On the altar are [depicted] . . . Aphrodite, Athena and Artemis. They are carrying to heaven Hyakinthos and Polyboia, the sister, they say, of Hyakinthos, who died a maid." "Oh, how powerful kind Venus [Aphrodite], is thy reign! That savage creature [the Kyklops Polyphemos] . . . who scorned the gods of great Olympos (Di Olympi), now felt pangs of love." "And the goddess [Aphrodite] made plain to Aison's son [Jason] the lore of prayers, and spells of magic incantation, that he might rob Medea's heart . . . driving her with Persuasion's (Peitho's) lash." "[Hera addresses Athene :] ‘We must have a word with Aphrodite. Let us go together and ask her to persuade her boy, if that is possible, to loose an arrow at Aeetes' daughter, Medea of the many spells, and make her fall in love with Iason’ . . .
With that she rose to go. Athene followed her, and the pair left for home. Kypris too set out, and after searching up and down Olympos for her boy, found him far away in the fruit-laden orchard of Zeus. With him was Ganymede, whose beauty had so captivated Zeus that he took him up to heaven to live with the immortals. The two lads, who had much in common, were playing with golden knuckle-bones. Eros, the greedy boy, was standing there with a whole handful of them clutched to his breast and a happy flush of mantling his cheeks. Near by sat Ganymede, hunched up, silent and disconsolate with only two left. He threw these for what they were worth in quick succession and was furious when Eros laughed. Of course he lost them both immediately--they joined the rest. So he went off in despair with empty hands and did not notice the goddess's approach. Eros gathered up his knuckle-bones, counted them all carefully, and put them in the fold of his mother's shining robe. Fetching his quiver from where it leant against a tree, he slung it on his shoulder with a golden strap, picked up his crooked bow . . . he crouched low at Iason's feet, fitted the notch to the middle of the string, and drawing the bow as far as his hands would stretch, shot at Medea. And her heart stood still. With a happy laugh Eros sped out of the high-roofed hall on his way back, leaving his shaft deep in the girl's breast, hot as fire. Time and again she darted a bright glance at Iason. All else was forgotten. Her heart, brimful of this new agony, throbbed within her and overflowed with the sweetness of the pain." 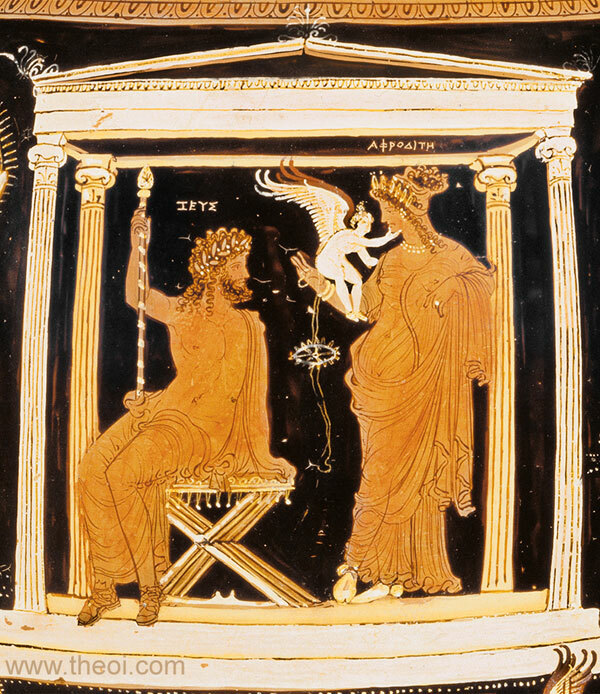 "[Depicted on the chest of Kypselos :] Medeia is seated upon a throne, while Jason stands on her right and Aphrodite on her left. On them is an inscription: - Jason weds Medeia, as Aphrodite bids." "Aeetes appointed this task for Jason, if he wished to take away the Golden Fleece--to yoke with yoke of adamant the bronze-footed bulls which breathed flames . . . [and] since she [Hera] knew that Jason could not perform the commands without help of Medea, she asked Venus [Aphrodite] to inspire Medea with love. At Venus' [Aphrodite's] instigation, Jason was loved by Medea. By her aid he was freed from all danger." "Venus [Aphrodite] smiled upon the lovers [Jason and Medea as they marry], and Cupid [Eros] with his pleadings roused Aeetes' daughter from the gloomy thoughts that vexed her; Cytherea [Aphrodite] clothes the girl with her own robe of saffron texture, and gives her own twofold coronal and the jewels destined to burn upon another bride." When Aphrodite had said this, the Kharis weeping replied : ‘O mother of the Erotes (Loves)! O sower of life in the everlasting universe . . .I am tormented by the afflictions of Lyaios [Dionysos] my father, driven about in terror by the Erinyes [inflicted upon him by Hera during his War with the Indians]. He is your brother--protect Dionysos if you can!’ . 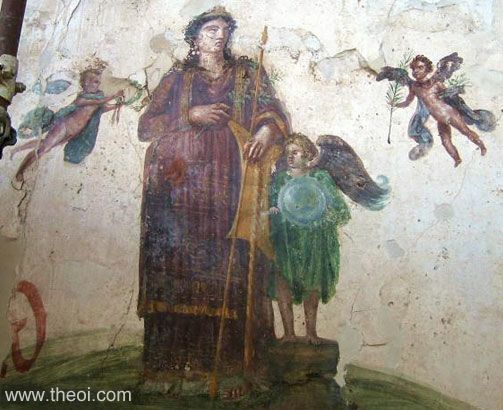 . .
Then sweetsmiling Aphrodite put off the wonted laugh from her radiant rosy face, and told her messenger Aglaia [one of the elder Kharites] to call Eros her son, that swift airy flyer, that guide to the fruitful increase of the human race. The Kharis moved her footsteps, and turned her face this way over earth and sea and sky, if somewhere she might find the restless track of Eros--for he beats his wings everywhere circling the four separate regions of the universe [earth, sea, sky and (underworld?)]. She found him on the golden top of Olympos, shooting the nectar-drops from a cup [playing cottabus and game in which wine was thrown out of cups at a mark] . . . He spoke, and straight through the air he plied his feet, and reached the dwelling of eager Aphrodite long before Aglaia with his pair of whirring wings. So spoke the goddess; and Eros wildly leapt from his mother's lap and took up his bow, slung the allvanquishing quiver about his little shoulder, and sailed away on his wings through the air ... paddling his way with the double beat of his floating wings he mounted to the starry barriers of his father [Ouranos the Sky], leaving the Indian [Morrheus] transfixed with the fiery shaft. Now Morrheus moved lovesick this way and that way, struck by the arrow of desire, wherever the maiden went; the sword he lifted was tame, his spear hung idle, his bold spirit was lashed by the cestus of love, he turned his enamoured gaze all about and moved his eyes at the bidding of Kypris, uncomforted." "A weasel once fell in love with a handsome young man and the blessed goddess Kypris [Aphrodite], the mother of desire (pothon meter), allowed the weasel to change her shape, so that she appeared to be a beautiful woman whom any man would be glad to take as his wife. As soon as the young man laid eyes on her, he also fell in love and wanted to marry her. While the wedding feast was in progress, a mouse ran by. The bride leaped up from her richly decorated couch and began to run after the mouse, thus bringing an end to the wedding. After having played his little joke, Eros took his leave: Phusis (Nature) had proved stronger than Eros (Love)." N.B. There was a popular Greek proverb "weasels don't wear wedding gowns" (Zenobius 2.93) associated with this fable. "There were two young men who both wanted to marry the same girl. The well-off young man won the prize, since the poor man had nothing more to offer than his good name and good looks. When the appointed wedding day arrived, the grief-stricken lover was unable to endure the heartbreak and hid himself away in his country home just outside the city. This poor man's home happened to be located quite near the rich man's opulent manor, the future home of that young bride who was now about to leave her mother's care forever (the groom's house in the city had not seemed sufficiently large for the occasion). The wedding procession unfolded, with a large crowd of guests in attendance and Hymenaeus, the god of marriage, leading the way, the wedding torch in his hand. There was also a donkey standing at the threshold of the gate, who was regularly put out for hire by the poor man, his owner, and it just so happened that the family of the bride had decided to hire this very donkey so that the bride would not bruise her feet on the rough road. At this moment, Venus [Aphrodite], the goddess of love, showed her compassion: the clouds in the sky were tossed by the winds and a crack of thunder shook the heavens. As grim night descended with a dense downpour of rain, the light was snatched from everyone's eyes and the terrified party guests were pelted with hail as they scattered in all directions. While everyone ran in search of shelter from the storm, the donkey scampered under a familiar roof that he found nearby, and announced his arrival with a loud ‘hee-haw.’ The household slaves came running up and were amazed to see a beautiful young woman in the wagon. They then went to inform their master, who was reclining with a few of his friends at the table, trying to cheer his broken heart with one cup of wine after another. When the man heard what had happened, he rejoiced at this unexpected pleasure. 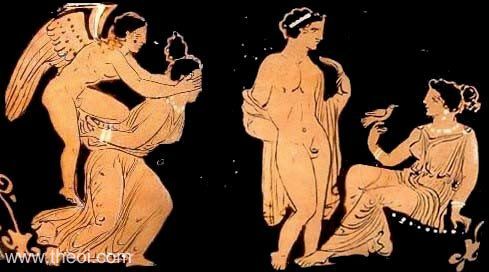 Incited now by both Bacchus [Dionysos] and Venus [Aphrodite], the man joyfully completed the wedding ceremony, applauded by his companions. Meanwhile, the family of the bride sent the town crier to look for her, while the erstwhile groom lamented his runaway bride. When the turn of events became known to the general public, they all praised the good will of the gods." "A man was in love with an ugly, wicked slave-woman from his own household and was quick to give her whatever she asked for. This slave-woman, bedecked with gold and trailing a delicate purple robe around her legs, would pick fights with the master's wife at every opportunity. It was Aphrodite, the goddess of love and beauty, whom she regarded as the cause of her good fortune, so she lit lamps in the goddess's honour, sacrificing, praying, begging, and beseeching her every single day. Finally the goddess came to the couple as they were sleeping. She appeared to the slave-woman in a dream and said, 'Do not give thanks to me; I certainly did not make you beautiful! Indeed, I am furious that this man would even think you were worth looking at." "When Juno [Hera] boasted of her chastity, Venus [Aphrodite] didn't want to quarrel with her so she did not dispute what Juno [Hera] said, but in order to show that no other woman was as chaste as Juno [Hera] she reportedly asked some questions of a hen. ‘So,’ Venus [Aphrodite] said to the hen, ‘could you please tell me how much food it would take to satisfy you?’ The hen answered, ‘Whatever you give me will be enough, as long as you let me use my feet to scratch for something more.’ ‘What about a peck of wheat: would that be enough to keep you from scratching?’ ‘Oh my, that is more than enough food, of course, but please let me go on scratching.’ Venus [Aphrodite] asked, ‘Then what do you want to completely give up scratching?’ At that point the hen finally confessed her natural-born weakness and said, ‘Even if I had access to a whole barn full of grain, I would still just keep on scratching.’ Juno [Hera] is said to have laughed at Venus's [Aphrodite's] joke, because by means of that hen the goddess had made an indictment of women in general." N.B. There was a popular Greek proverb "don't sacrifice a pig to Aphrodite" (Erasmus, Adages 3.1.30) derived from this fable used for someone who gave an inappropriate or unwanted gift.